Many diesel tractors require the use of two batteries to help start the large lumbering engines. 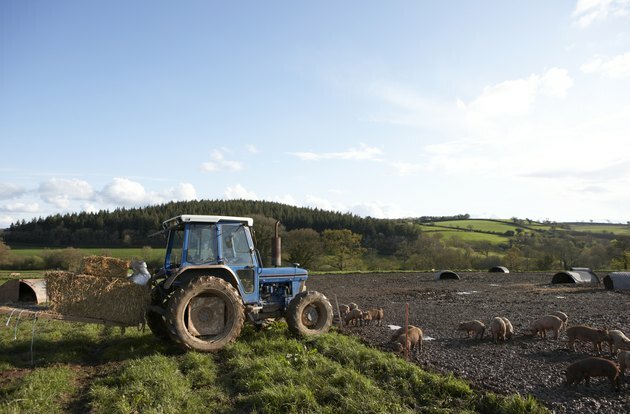 Often during the beginning of the farming season, a diesel tractor will require a jump start if the tractor was not used during the winter months. The batteries on a diesel tractor are wired parallel to each other, meaning that the battery's negative terminals connect together and the positive terminals connect together. This doubles the amperage of the batteries but maintains a 12-volt output. This makes jump-starting two batteries straightforward. Diesel tractors often have two batteries. Place the red cable clamp on one end of the jumper cables onto the positive battery terminal on one of the tractor's batteries. It does not matter which battery you choose to jump since power passes through both batteries. Place the black cable clamp from the same end of the jumper cables onto a piece of bare grounded metal on the tractor's chassis. If you cannot find or reach any bare metal with the cable clamp, you can place the clamp on the negative battery terminal on the same battery as you placed the red cable clamp. 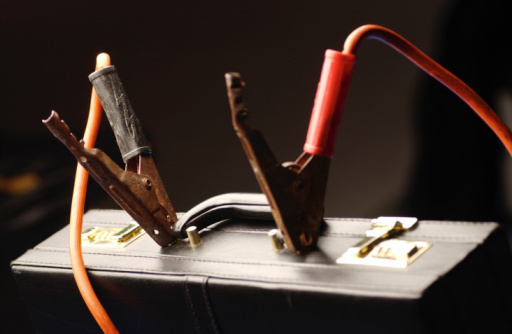 Place the red cable clamp on the other end of the jumper cable onto the positive terminal of the charged 12-volt battery, such as a truck battery. 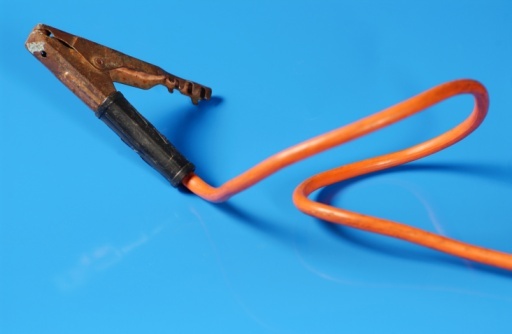 Place the black cable clamp from the same end of the jumper cables onto a piece of bare grounded metal on the truck's chassis. If you cannot find or reach any bare metal with the cable clamp, you can place the clamp on the negative battery terminal on the battery. Start the truck, and allow it to run at an idle for approximately five minutes. This will charge the batteries on the tractor enough to turn it over. Start the tractor while the batteries on the tractor are connected to the battery on the truck. Remove the negative battery cable from the truck, and then remove the red cable clamp from the truck's battery. Remove the negative battery cable from the tractor, and then remove the red cable clamp from the tractor's battery.